An upsurge in the global energy demand warrants efficient electrochemical energy storage technologies due to (i) the rapid dwindling of traditional energy reserves (e.g., fossil fuels, natural gas); (ii) the failure of current battery storage technologies (regardless of the origin of energy generation, viz., solar, wind) to meet industrial demands for combined power and energy densities; and (iii) the great promise of advanced nanostructured materials for improving charge storage mechanisms. Capacitors can deliver high-power density while batteries can deliver high-energy density. Supercapacitors, expected to bridge the gap between batteries and capacitors, may well enhance every aspect of electrical energy usage, from transportation to communications and computing. Supercapacitors: Currently, we focus on synthesizing vertically aligned carbon-nanotubes (VACNTs) on aluminum ribbons to design and fabricate high-power-high-energy supercapacitors. The VACNTs possess high electrical conductivity and can be grown directly on current collectors such as aluminum in a roll-to-roll in-house CVD process. Graphene also exhibits high electrical conductivity and surface area and can be used as an active material for supercapacitors. We found that plasma induced defects in few-layer graphene improves electrolyte transport and increases access to interior active area, and thusly improves capacitance. a) Schematic of a roll-to-roll in-house CVD process for growing VACNTs on aluminum ribbons. b) Photograph of aluminum ribbon before and after the VACNT growth. c) SEM image of the VACNTs. 1. “Carbon Nanotube Materials to Realize High-Performance Supercapacitors”, A. Childress, J. Zhu, M. Karakaya, D. Saini, R. Podila and A. M. Rao, in Nanotechnology for Energy Sustainability, Eds. B. Raj, M. Van de Voorde, and Y. Mahajan, Wiley-VCH, 2, 377-389 (2017). 3. “Modulation of the electrostatic and quantum capacitances of few layered graphene through plasma processing”, R. Narayanan, H. Yamada, M. Karakaya, R. Podila, A. M. Rao, and P. R. Bandaru, Nano Letters, 15, 3067 DOI: 10.1021/acs.nanolett.5b00055 (2015). 4. “Roll-to-Roll Production of Spray Coated N-doped Carbon Nanotube Electrodes for Supercapacitors”, M. Karakaya, J. Zhu, A. J. Raghavendra, R. Podila, S. G. Parler Jr., J. P. Kaplan, and A. M. Rao, Applied Physics Letters 105, 263103 (2014). 5. “Roll-to-Roll Synthesis of Vertically Aligned Carbon Nanotubes for Electrical Double Layer Capacitors”, Margarita R. Arcila-Velez, Jingyi Zhu, Anthony Childress, Mehmet Karakaya, Ramakrishna Podila, Apparao M. Rao and Mark E. Roberts, Nano Energy 8, 9-16 (2014). Metal ion batteries: The development of safe and affordable lithium ion batteries (LIBs) is essential for the use of battery-powered electronics and hybrid vehicles. However, the state-of-the-art LIBs exhibit undesired internal resistances leading to a significant reduction in their energy and power densities. Recently we engineered a VACNT-based current-collector-active-material (CCAMI) interfacial layer for LIB cathodes, which enhanced areal capacities at low and high discharge currents. In addition, we developed aqueous slurries to replace the expensive and environmentally harmful solvents that are currently being used by the industries in LIB cathode manufacturing. We also developed rechargeable aluminum-ion batteries (AIBs) that are far safer and a less expensive alternative compared to existing LIBs. Few layered graphene (FLG) foam serve as cathodes, and the intercalation of AlCl4- ions present in ionic liquid electrolytes is monitored via in-situ Raman spectroscopy in tandem with electrochemical methods. (a) Schematic of a graphene-based aluminum ion battery (AIB). (b) Density Functional Theory derived model of charge transfer between graphene layers and the AlCl4-intercalant ion. (c) A cyclic voltammogram of an AIB. The peaks illustrate different stages of intercalation. 1. “A Raman spectroscopic study of graphene cathodes in high-performance aluminum ion batteries”, Anthony S Childress, Prakash Parajuli, Jingyi Zhu, Ramakrishna Podila, Apparao M Rao, Nano Energy, 39, 69-76 (2017). 2. “An Iodine Quantum Dots Based Rechargeable Sodium–Iodine Battery”, Decai Gong, Bin Wang, Jingyi Zhu, Ramakrishna Podila, Apparao M. Rao, Xinzhi Yu, Zhi Xu, and Bingan Lu, Advanced Energy Materials, DOI: 10.1002/aenm.201601885 (2016). 4. “Lithium Intercalation into Chemically-Etched Multi-Walled Carbon Nanotubes” Heon-Cheol Shin,Meilin Liu, B. Sadanadan, A. M. Rao, J. Solid State Electrochem., 8(11) 908-913 (2004). 5. “Electrochemical Insertion of Lithium into Multiwalled Carbon Nanotubes Prepared by Catalytic Decomposition”, H.-C. Shin, M. Liu, B. Sadanadan and A. M. Rao, J. Power Sources, 112, 216-221 (2002). Energy harvesting from alternate renewable sources is imperative for a green future. We explore nanomaterials for energy harvesting via the triboelectric and thermoelectric effects. Triboelectric Nanogenerators: Triboelectricity is generally considered undesirable as stray charges developed due to friction can damage electronic equipment, or industrial machinery. However, at CNI we are engineering novel energy harvesting devices called triboelectric nanogenerators (TENGs) that can convert waste mechanical energy into useful electrical energy. TENGs can generate several hundreds of volts by simple mechanical motions such as hand tapping. 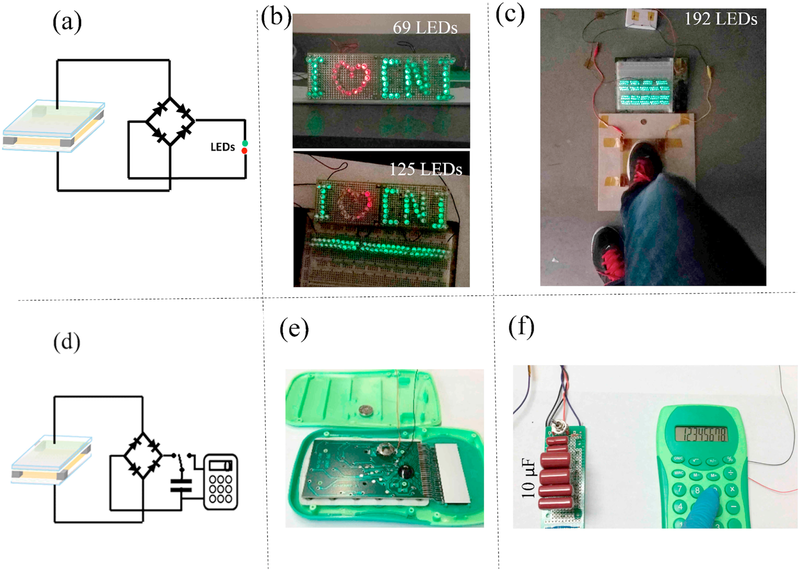 Using readily available off-the-shelf materials we built a robust, flexible, and ultra-simple U-TENG that can generate up to 500 V when mechanically activated by hand or foot tapping. A U-TENG can readily power over 200 LEDs without the need for any other power source, such as a battery. The flexible U-TENG can also be integrated into textile for harvesting wind energy. (a) Schematic of U-TENG for powering commercial LEDs. (b) LEDs powered by a 3.5 × 2.75 cm2 sized U-TENG. (c) A relatively larger (14 × 14 cm2) U-TENG operated by simple foot tapping. Sai Sunil Kumar Mallineni, Herbert Behlow, Yongchang Dong, Sriparna Bhattacharya, Ramakrishna Podila, and Apparao M Rao, Nano Energy 35, 263-270 (2017). Using chemical/mechanical energy we exfoliated a state-of-the-art thermoelectric bulk material (e.g., n-type Bi2Te3) into 2D sheets, and spark plasma sintered the resulting powder into pellets. Restacking of the exfoliated layers of n-type Bi2Te3 by SPS created charged grain boundaries (CGBs) that led to energy filtering of charged carriers and an enhanced thermoelectric performance. We obtained strong evidence for the existence of these CGBs via micro-Raman spectroscopy and Kelvin probe force microscopy. (a) Scanning electron microscope image of charged grain boundaries in n-type Bi2Te3, and (b) schematic of the energy barrier EB across the charged grain boundaries. 1. “The intrinsic thermal conductivity of SnSe”, Pai-Chun Wei, S. Bhattacharya, J. He, S. Neeleshwar, R. Podila, Y. Y. Chen, and A. M. Rao, Nature, 539, Issue 7627, Pages E1-E2 (2016). 2. “Thermoelectric properties of spark plasma sintered lead telluride nanocubes”, B. Khasimsaheb, S. Neeleshwar, M. Srikanth, S. Bathula, B. Gahtori, A. K. Srivsatava, A. Dhar, A. Sankarakumar, B. K. Panigrahi, S. Bhattacharya, R. Podila, A. M Rao. J. of Materials Research, 30, 2638-2648 (2015). 3. “Preferential Scattering by Interfacial Charged Defects for Enhanced Thermoelectric Performance in Few-layered n-type Bi2Te3”, Pooja Puneet, Ramakrishna Podila, Mehmet Karakaya, Song Zhu, Jian He, Terry M. Tritt, Mildred S. Dresselhaus, and Apparao M. Rao, Nature Scientific Reports (2013); 3 Article number: 3212. DOI: 10.1038/srep03212239. 4. “Enhancement of Thermoelectric Performance of Ball-Milled Bismuth Due to Spark-Plasma-Sintering-Induced Interface Modiﬁcations”, Pooja Puneet, Ramakrishna Podila, Song Zhu, Malcolm J. Skove, Terry M. Tritt, Jian He and A. M. Rao, Advanced Materials 25, 1033 (2013). 5. “Reexamination of infrared spectra of Bi nanorods: L-T transition or extrinsic phases” K. Lingam, J. Reppert, D. Dickel, R. Podila, P. Puneet, E. Sheftic, N. Kuthirummal, M. J. Skove, J. He, and A. M. Rao in Nano: Brief reviews and reports, 7 1230003 (2012). As the use of lasers becomes increasingly popular in fundamental science studies, and applications such as medical imaging, communication and manufacture industry, new concerns about laser damage and laser protection arise. Due to the lack of efficient materials for laser energy absorption, search for new materials becomes urgent. 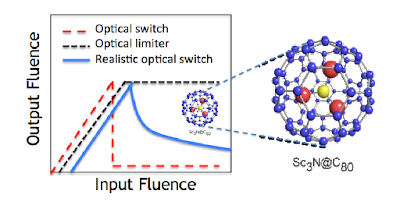 We explored nanomaterials with unique non-linear properties such as fullerenes using a Z-scan technique and investigated the role of defects and dopants on its electronic structure to further control its non-linear optical properties. Specifically, we found that fullerene exhibits a strong reverse saturable absorption property enabling absorption of intense laser energy that can be enhanced by encapsulating it in Sc3N, leading to passive optical switches with significantly low limiting threshold. 1. “Role of defects in the nonlinear optical absorption behavior of carbon and ZnO nanostructures”, B. Anand, S. R. Krishnan, R. Podila, S. S. S. Sai, A. M. Rao and R. Philip, Physical Chemistry Chemical Physics 16, 8168 (2014). 2. “Optical Diode Action from Axially Asymmetric Nonlinearity in an All-Carbon Solid-State Device” B. Anand, R. Podila, K. Lingam, S. R. Krishnan, R. Philip, S. S. S.Sai, and A. M. Rao, Nano Lett. 13, 5771 (2013), DOI: 10.1021/nl403366d. 3. “Non-linear optical properties of B-doped single walled carbon nanotubes” B. Anand, R. Podila, P. Ayala, R. Philip, S. S. S. Sai, K. Venkataramaniah, and A. M. Rao, Nanoscale, 5, 7271 (2013). 4. “Non-linear optical properties of organic and inorganic nanostructures” V. S. Muthukumar, R. Podila, B. Anand, R. Philip, S. S. Sai and A. M. Rao Springer Encyclopedia of Nanotechnology , 1895-1911 (2012). 5. “Nonlinear Optical Absorption and Induced Thermal Scattering Studies in Organic and Inorganic Nanostructures”, Sai Muthukumar V., Ramakrishna Podila, Benoy Anand, S. Siva Sankara Sai, K. Venkataramaniah, Reji Philip and Apparao M. Rao in Encyclopedia of Nanotechnology, Ed. Bharat Bhusan, Springer-Verlag, 3, 1895-1911 (2012). Methods for studying mechanical resonances in micro- and nano-sized cantilevers are critical for developing future micro- and nano-electromechanical systems. We use our patented “Harmonic Detection of Resonance” method to electrically actuate mechanical oscillations in micro- and nanoscale cantilevers, and electrically detect the resonance amplitude. Examples include the use of HDR for measuring mechanical resonances in commercially available silicon microcantilevers and cantilevered nanostructures (e.g., the multiwalled carbon nanotubes, coiled carbon nanotubes and ZnO nanowhiskers). HDR is an elegant method as it is fully electrical in nature, and overcomes parasitic capacitance that has significantly limited the capability of previous techniques. In addition to sensing the presence or absence of gases in the vicinity of a resonating micro-cantilever, we use the HDR method to understand the fundamental mechanisms for electrically actuated mechanical resonances in semi-conducting nanowhiskers. 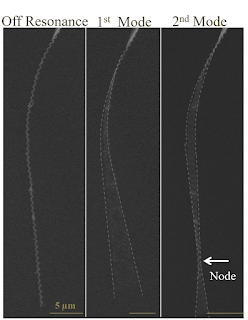 The 1st and 2nd modes of a helically coiled carbon nanowire fixed at one to a tungsten tip. 1. 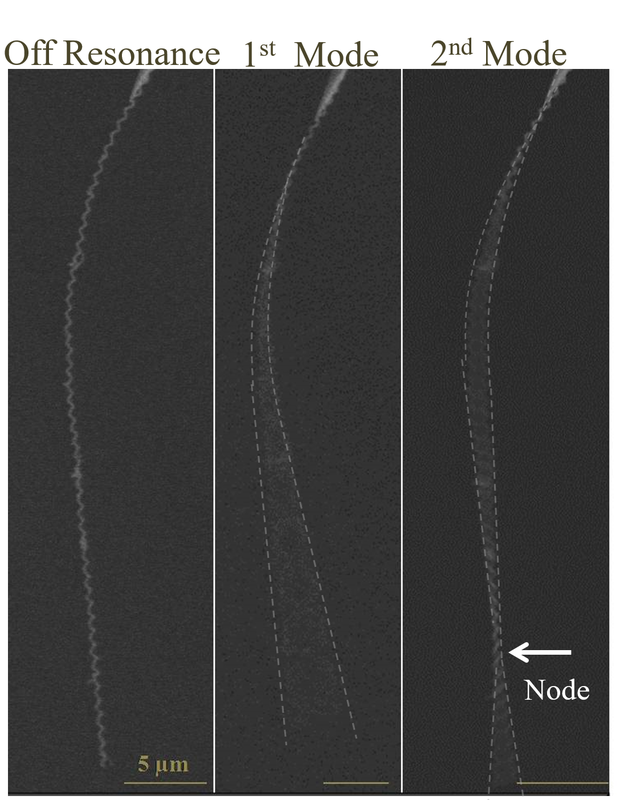 “Mechanical Resonances of Helically Coiled Carbon Nanowires”, D. Saini, H. Behlow, R. Podila, D. Dickel, B. Pillai, M. J. Skove, S. M. Serkiz, and A. M. Rao, Nature Scientific Reports 4, 5542 (2014) doi:10.1038/srep05542. 2. “Harmonic detection of resonance method”, Deepika Saini, Herbert W Behlow, Steven Serkiz, Malcolm Skove, A. M. Rao, Nanotechnology, Special Issue dedicated to IEEE Nano, 188 (2014). 3. “Harmonic Detection of Resonance: A Review”, Deepika Saini, Herbert Behlow, Malcolm J. Skove and A. M. Rao, in Recent Patents on Materials Science, Bentham Scientific Publishers, 6 (3), September (2013). 4. "Harmonic Detection of Resonance Method for Micro- and Nano-cantilevers: Theory and Selected Applications", J.D. Taylor, B. Elliott, D. Dickel, G. Keskar, J. Gaillard, M.J. Skove, and A.M. Rao in Frontiers in Nanoscience and Nanotechnology, Eds. Anant Narlikar and Yunyi Fu, Oxford University Press (2009). 5. “An Analytic Characterization of the Harmonic Detection of Resonance Method”, D. Dickel, M. J. Skove and A. M. Rao, J. Appl. Phys. 106, 044515 (2009).